The explosion that opened the atomic age more than 70 years ago is helping scientists better understand another dramatic event: the formation of the moon. On July 16, 1945, the U.S. Army detonated the first-ever nuclear bomb, conducting the event at the Trinity test site in southern New Mexico. The extreme heat of the blast melted the surrounding sandy soil’s top layer into a green, radioactive glass known as trinitite for about 1,150 feet (350 meters) in all directions from ground zero. Many astronomers think the moon coalesced out of material blasted into space by a huge collision, or series of collisions, involving the proto-Earth and a Mars-size body (or bodies) roughly 4.5 billion years ago. Theory predicts that such impacts would have generated immense amounts of heat, which in turn would have driven volatiles out of the rocks that evenutally formed the moon. The new trinitite analysis bolsters this notion, said study lead author James Day, of the Scripps Institution of Oceanography at the University of California, San Diego. 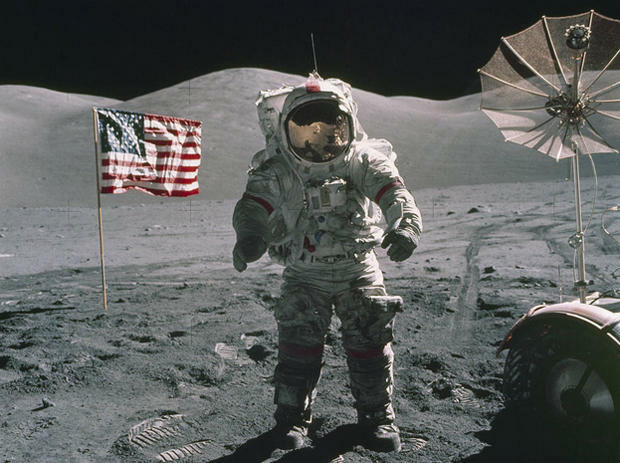 “This study basically provides empirical, experimental, if you will, evidence — and that experiment is the Trinity nuclear blast — to show that the signatures that we observe in the moon really are formed by these high-temperature, volatile-loss processes,” Day told Space.com. Day and his colleagues studied pieces of trinitite from various locations; some were within 33 feet (10 m) of ground zero, and others were collected 330 feet (100 m) and 490 feet to 820 feet (150 to 250 m) away. The Trinity site was bulldozed for safety reasons in the early 1950s, so the researchers couldn’t go out to the field to collect the material themselves. Day and his team then measured the abundance of various isotopes of zinc in the trinitite. (Isotopes are variants of an element that contain different numbers of neutrons in their atomic nuclei.) Zinc may not seem too volatile here on Earth, but it boils off under extreme temperatures such as those experienced during the putative moon-forming impact(s), Day said. The researchers found that trinitite located closer to ground zero, where temperatures were higher, harbored less zinc than did samples from farther away. In addition, the zinc that remained was preferentially composed of heavy isotopes, which do not evaporate as easily, the researchers said. He also voiced hope that people could take a measure of inspiration from the swords-to-plowshares aspect of the study, which was published online Wednesday n the journal Science Advances. “That a human-history-changing event, the nuclear detonation, can be used for some scientific benefit — I think there are some important lessons to be learned in that,” Day said.